Under 12 League Cup winners Baston. Baston gained some big revenge over arch Under 12 rivals Deeping Blue when the two sides clashed in the Junior Alliance League Cup final at Chestnut Avenue on Sunday (April 10). 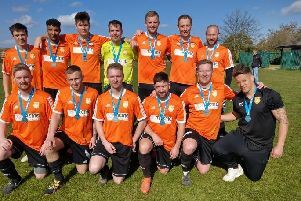 Deeping had taken the honours twice in league fixtures between the two sides this season (1-0 and 2-0) to virtually wrap up the Division One title race, but Baston made it a case of third time lucky in the cup final. Under 12 League Cup runners-up Deeping Blue. They inflicted a first defeat of the saeason on the Blue boys, coming from behind to take the honours 2-1 with goals by Adam Blackbird and Oliver Tooth. Baston had the better chances in the first half and went close to opening the scoring in the third minute when Keelan Walker’s header hit the post. Josh Ford and Walker also forced Deeping’s Max Rigby into making fine saves in the first half. But Deeping started the second half brightly and went in front two minutes after the break when Finlay Henderson turned the ball in from a corner. Under 11 PFA Cup winners Yaxley. They beat Feeder Soccer 3-1 in Sunday's final at Chestnut Avenue. Their team was: Lewis Arber, Christopher Brazil, Francis Buckle, Ceri Hayes, Morgan Hossack, Harvey Laughton, Adrijan Lutolli, Louis Rodriguez, Connor Sanderson. Subs: George Dhanushan, Max Hill, Taylor Roan, Luke Simpson-Morris, Liam Unalkat. Baston responded almost immediately and Vinni Ball’s burst forward drew a free-kick on the edge of the area, which Blackbird lifted into the box and Tooth headed into the far corner. Six minutes later and Baston were in front when Ball launched a throw into the area and Blackbird fired home. Deeping pressed hard for an equaliser in the final quarter of the match but could not breach Baston’s defence again, with James Roberts pulling off two good saves to keep the lead intact. The sides meet again in the Lincs Cup final on May 6. The Under 11 PFA Cup runners-up were Feeder Soccer, whose Charlie Pywell won the man-of-the-match award. Their team was: Felix Chittock, George Dann, Jake Hardy, Macy Jackson, Ellis Mastin, Matthew Mills, Miles Morris, Charlie Pywell, Jude Watson. Subs: Bobby Dixon, Shay Markham, Louis Meadows, Louis Peters. Deeping Blue: Harry Barsby, Shane Bointon, Alfie Fox, Alfie Fryett, Harvey Henderson, Finley Nottingham, Archie Rickards, Max Rigby, Henry Rook. Subs: Joseph Cox , Finlay Henderson, Bob Horne, Joseph Purbrick. Baston: Adam Blackbird, Lewis Duncan, Joshua Ford, Freddie Fraser, Samuel Harris, Harrison Pearce, James Roberts, Oliver Tooth, Keelan Walker. Subs: Vinni Ball, Bailey Clifton, Bailey Coe. The Under 12 Hereward Cup final, played on Sunday at Stonald Fields, Whittlesey, also produced a shock result as Division Three champions Wisbech St Mary were beaten 2-1 by their sixth-placed rivals Kings Cliffe. Luigi Rao fired both goals for Kings - one in each half - with Piper Brundle replying for the Wisbech side. Kings Cliffe: Jonah Armitage, James Buck, Ewan Buckby, Harvey Chesterman, Ben Clancy, Harry Hodgson, Luigi Rao, Oakley Read, Tyler Sanderson. Subs: William Swales, Luke Yarland. Wisbech SM: Owen Brundle , Piper Brundle, Callum Campbell, Daniel Cave, Kieran Goodwin, Daniel Hills, Joshua Kirby, Ethan Peachey, Kian Pooley. Subs: Enzo Lioveri , Liam Locks, Rhys Swann, Joshua Wilkinson-Swain. This Sunday at Chestnut Avenue sees the Under 13 Hereward Cup final takes place between Park Farm Red and Park Farm Black (10am) followed by the Under 13 League Cup final between Alconbury and Hampton Blue (1pm).